Hi everyone! I am so excited to be part of this Growing In Unity Blog Hop! You should have just come from Karen Nofziger's blog, but if you are just stopping by, you can see a list of all the stops at the bottom of my post. For the hop today, we were all sent a Unity Stamp Co. stamp from the Phyllis Harris line - which I admit I squealed a bit when I opened the package because this line is one of my all time favorites! I know you have enjoyed the hop so far so I will get right to my card now. The stamp I received is called too beautiful for earth and I have had this on my wish list forever! 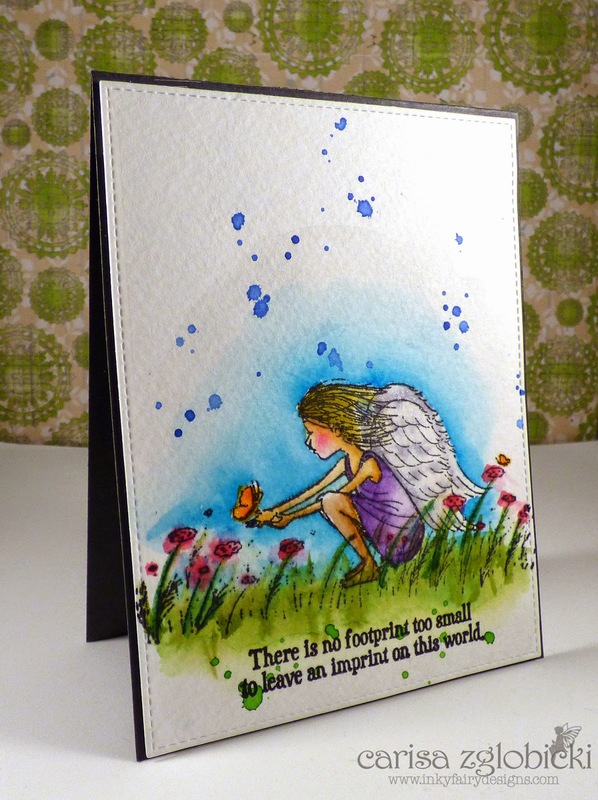 I think it is such a sweet image and I knew I was going to pull out my Peerless watercolors for this card. There are three sweet sentiments that come in this stamp set and they are all meant to lift up someone who has experienced a loss. It is always hardest for me to create sympathy cards and I think this stamp set is one to have in your collection just for those moments in life. Here is a close up of the coloring. I did a wash watercolor so it would appear very loose and flowing. I also added some clear Wink of Stella to her wings and the butterflies. After everything was dry I added a little splatter of color for some more texture. This is a one layer card and I just popped up the watercolor panel on some foam tape to my card base. Here is the list of everyone participating today! Be sure to check out all the posts and stop by the Unity Stamp Co Blog as there is a giveaway as well! Thanks so much for stopping by - if you liked my card today and don't want to miss a post please be sure to follow me by clicking the button below! Now, be sure to head on over to Lena Nun's blog for more inspiration in today's blog hop! This is just gorgeous, and such a work of art. The words would certainly comfort someone who had experienced a loss. Lovely colors, used to great effect! Your card is beautiful. This stamp set is perfect and needed all too often. Perfect for sending a message of comfort. I love how you colored this stamp! It is not easy to make sympathy cards but this stamp and sentiment make it just the tiniest bit easier and your card will surely be appreciated by the grieving. Stunning! I love this card. Beautiful image and sentiment. Well done! This card is simply amazing! What a wonderful job you did with your water coloring and the colors are so bright and brilliant! Beautiful! I love the colors you chose for watercoloring - soft yet vibrant! Love this card! Simple but breath taking! Your colors are so pretty. Lovely card. Stunning. The coloring is just beautiful. Your card is gorgeous. It will surely bring a bit of comfort to someone in need. Thanks for sharing. Gorgeous coloring! Love the water color look! Wonderful job! Thanks for hopping! This is beautiful and so very true. Awesome card and with such meaning. I like how you watercolored this sweet image. Fab vibrant coloring! Love the splats!! Great job on the card it's very lovely!!! Beautiful card,love the colors and the little angel girl,she is so sweet. I love this stamp and you totally brought it to life. Gorgeous work! Such a beautiful and soft card. 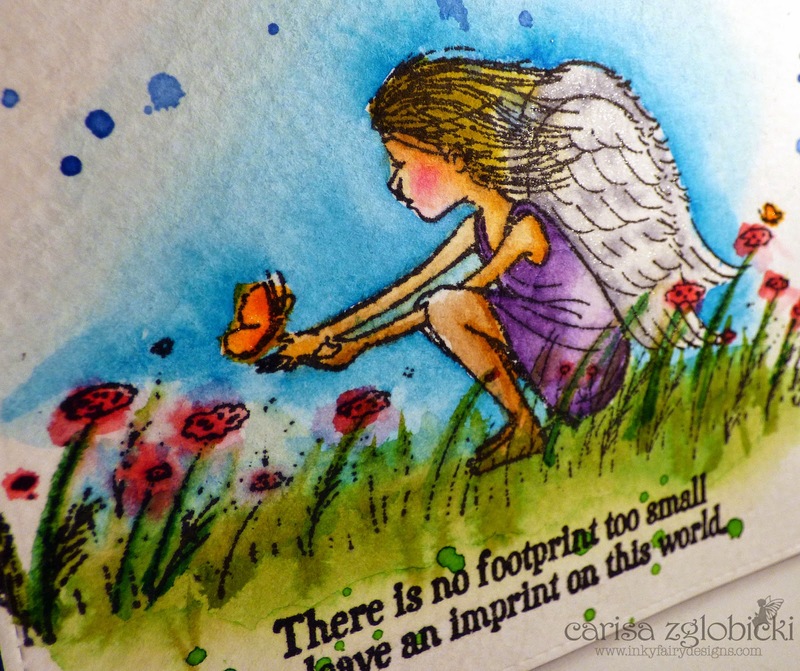 That stamp is on my wish list too...such a beautidul image and sentiment. Lovely work! The watercolor effect is so great. it's not overdone and is just perfect for this image! Wonderful!!! Your card (& coloring) is just stunning. I would have squealed opening this stamp too. 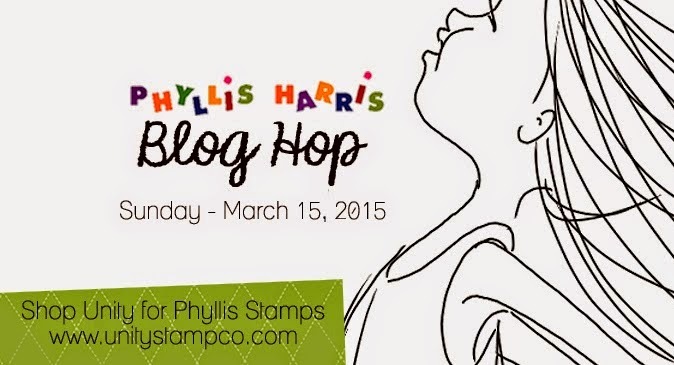 I love Phyllis Harris stamps. Your card is simply lovely. Beautiful image and so lovely the way you colored it. What a wonderful sentiment. Thanks for sharing this sweet card!! Excellent water-coloring. The tones are as comforting and uplifting as the message.